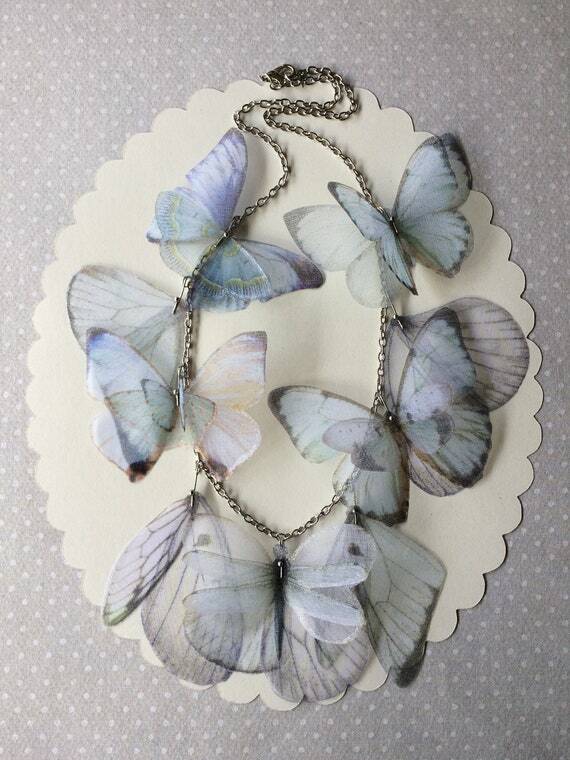 These butterflies, drangonflies and wings are like glass.. in lovely pale blue and white shades! Completely handmade necklace using silk organza fabric. I choose butterfly images from real pictures and vintage illustrations. Then I print them on high quality silk organza, hand-cut one by one and seal edges to prevent fabric fraying. I love to create these unique pieces of jewelry. Please pay attention when you wear the necklace. It is very delicate. Don’t stretch butterflies. Butterflies can’t be washed but they are waterproof. However don’t spray perfume over them. There are over 20 butterflies, dragonflies and wings on this necklace, and each one measure from 3 to 8 cm. Chain is long about 45 cm. (18 inches) with lobster clasp. I can also customize your necklace as you prefer! I’ll ship the necklace gift wrapped, for you or your loved one. These butterflies will fly to you with registered tracked airmail by Poste Italiane shipment service. Please read my policies before you buy. Please note that I’m not responsible for lost, stolen or damaged items, when they leave my hands. Please feel free to email me should you have questions, need further descriptions or pictures. New new new! Lovely hand-made hair bobby pins with dragonflies! I choose dragonfly images from real pictures and vintage illustrations. Then I print them on high quality cotton and silk organza, hand-cut one by one and I seal edges to prevent fabric fraying. Feminine.. ethereal.. light.. and romantic. Simply beautiful! I love to create these accessories! Dragonflies bobby pins are delicate. You can wear them on your hair every day but don’t stretch dragonflies and don’t wash (also if they are waterproof). And please don’t spray perfume or hair spray over them. 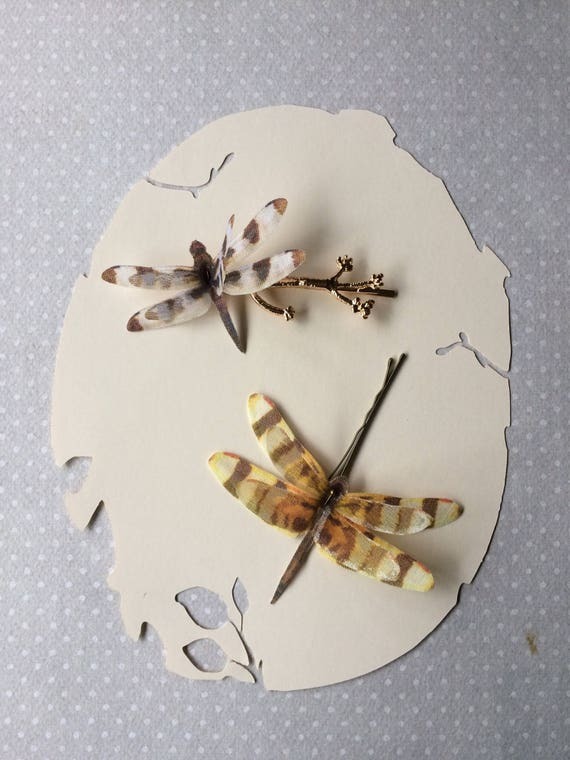 Every hair bobby pin is made using 2 dragonflies: one in cotton and one in silk organza, to create a 3D effect. You’ll received two hair pins: one has a 7.5 cm wingspan drangonfly (yellow/brown tones) with a gold bobby pin, long 5 cm. The other one has a 6 cm wingspan dragonfly (white/brown tones) with a gold branch tree bobby pin, long 5 cm. Your dragonflies will fly to you with registered tracked airmail by Poste Italiane shipment service. 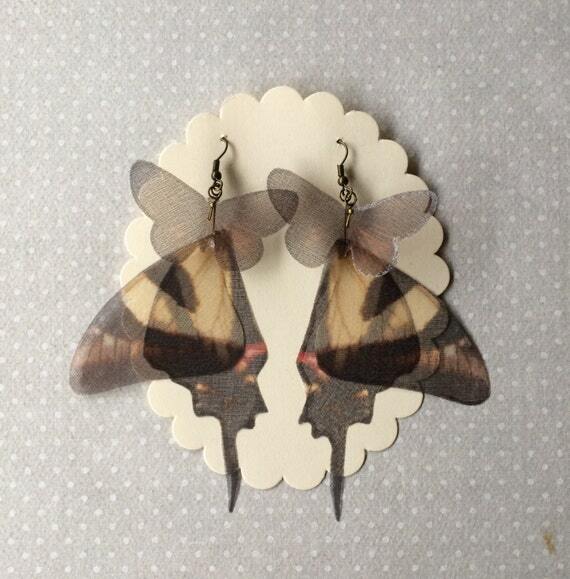 Completely hand-made earrings, with silk organza butterflies and wings. Please pay attention when you wear these earrings. They’re delicate. Don’t stretch, don’t wash and don’t spray perfume over butterflies and wings. 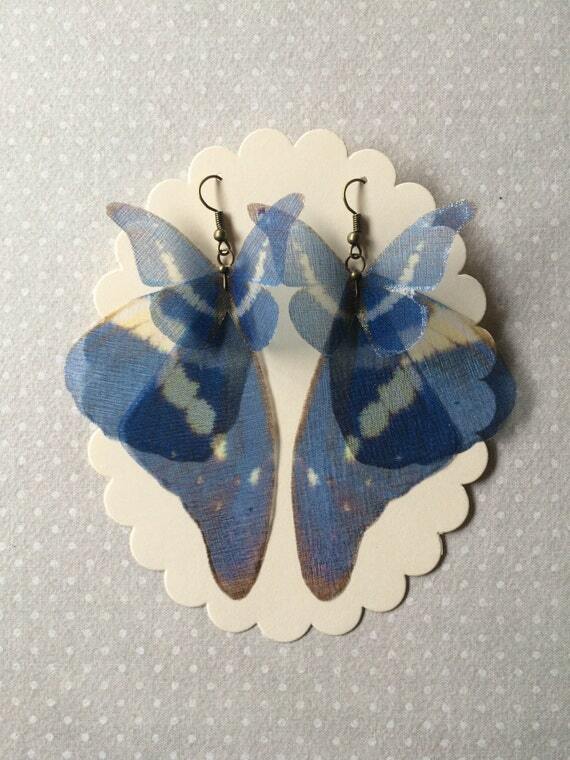 There are 6 butterflies (and wings) on these earrings and they measure about 9 x 7 cm. There are 6 butterflies (and wings) on these earrings, and they measure about 10.5 x 5 cm. I’ll ship the earrings gift wrapped, for you or your loved one. A new creation, dedicated to beauty and light of Ginkgo Biloba leaves, in sage green shades! Real leaves, as the silk organza leaves in this necklace, fly in the wind with all their magic.. I choose leaf images from real pictures and vintage illustrations. Then I print them on high quality silk organza, hand-cut one by one and seal edges to prevent fraying, creating every piece completely by hand. Please pay attention when you wear the necklace. It is very delicate. Don’t stretch leaves. Leaves can’t be washed but they are waterproof. However don’t spray perfume over them. There are 9 silk organza leaves on this necklace and a central real electroformed tree branch in antique copper, that is long about 11 cm. Antique bronze chain is long about 45 cm (18 inches) with lobster clasp. This necklace will fly to you with registered tracked airmail by Poste Italiane shipment service. A new creation dedicated to beauty and light of Ginkgo Biloba leaves in autumn. 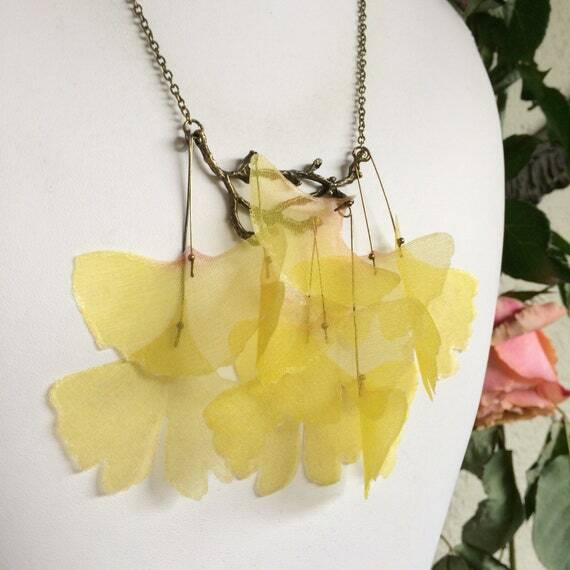 Real leaves, as the silk organza leaves in this necklace, fly in the wind with all their magic! I chose images one by one, from real pictures and vintage illustrations. Then I printed them on high quality silk organza, cut and sealed, creating every piece completely by hand. 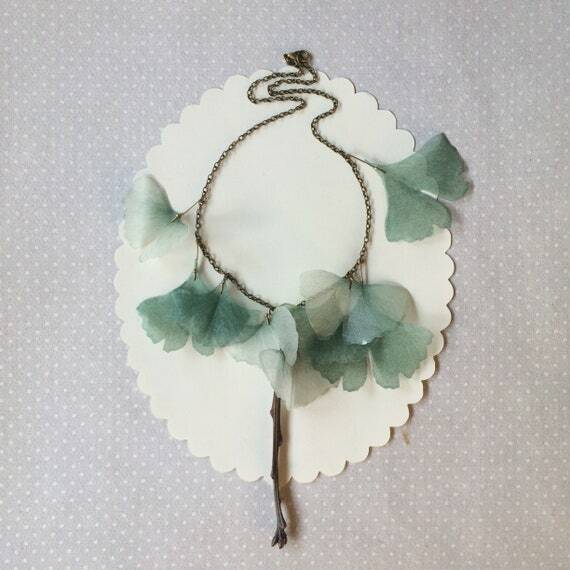 There are 9 silk organza leaves on this necklace, hanged on antique bronze tree branches, and each one measure from 5 to 7 cm. Antique bronze chain, included central piece, is long about 50 cm. (20 inches) with lobster clasp.